Jomolhari trek is one of the top walks in Bhutan, and one of the world's best treks, hikes and climbs. 13 Days Bhutan Adventure Travel Tours (Jomolhari Trek) challenging trek starts at Drugyal Dzong in the north of Paro Valley. Hiking through rice paddy fields, apple orchards, forests, rushing steams, the trek gradually becomes challenging. After two nights camping in the wooded alpine forests and meadows, you will arrive at Jangothang base camp and from here you will have a stunning view of 7513m Mount Jumolhari. The next day’s trail is through high pastureland and after crossing the highest point, Nyile La Pass (4,890m), you arrive at Lingshi, the highest settlement in the north. You will have some spectacular views of the high ridges and snow-capped mountains. Yaks, blue sheep, musk deer and elusive marmots are also the common sights on this trek. 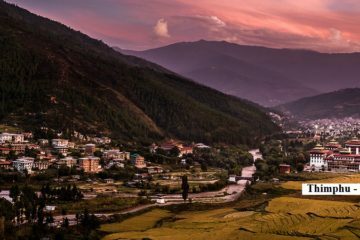 The last few days trek, through conifer forests, canyons and streams, you arrive at Dodena, where your car will be waiting here to transfer to Thimphu. Take a hot shower in the hotel and relax for the next day’s tour in the city. View 13 Days Bhutan Adventure Travel Tours in Google Map. Arriving at Paro International airport and upon clearing immigration and customs, you will meet with your guide and driver. Drive to Hotel. After Lunch drive towards Sang Chokhor Buddhist College and Kyichu Lhakhang. Evening stroll down the Paro Town. Morning, we will hike to Paro Taktshang, later visiting Druk-yul Dzong, Ta-dzong and Rimpong Dzong if time permits. 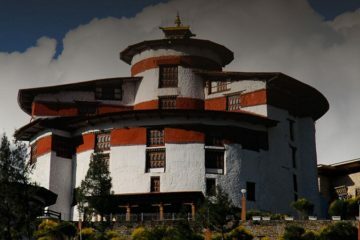 The trek starts from Drugyal Dzong at 2,580 m with a downhill walk on a wide trail. The trail climbs gently traversing through well-maintained rice terraces and fields of millet. The route later enters an area of apple orchards and forests. Soon the valley widens and you reach the army post of Gunitsawa at 2,810m. This is the last stop before Tibet. At 2,870m, just beyond Shana Zampa, there are several good camping places in meadows surrounded by trees. The trail again follows Pa Chhu (Paro River), ascending and descending through pine, oak and spruce forests. Hot lunch will be served after crossing the bridge towards the left side of the river. After lunch follow the river climbing up through rhododendron forests and finally crossing the bridge again, reaching to the campsite at the altitude of 3,750m. The path ascends for a while till you reach the army camp. Then follow the river above the tree line enjoying the stunning view of surrounding peaks. Hot lunch will be served inside a yak herder’s camp. A short walk into the valley will take you to the camp at Jangothang at an altitude of 4,040m. From here, the view of Mt. Jhomolhari and Jichu Drake are superb. Today is a rest and acclimatization for the next day’s highest climb on this trek. You will hike to explore near by mountains and lakes. The trail follows the stream or half an hour and crosses the bridge to the right side. Start the climb up to the first ridge with a breathtaking view of Jhomolhari, Jichu Drake and Tshering Gang. Then Walk towards the valley, almost flat for a while, until the climb to the Ngye La pass at an altitude of 4,700m. After the pass, it is a gradual descent to the Lingshi camp, enjoying the panoramic view of the peaks and Lingshi Dzong. Camp at an altitude of 4000m. The Laya Gasa route leaves the Jhomolhari trek here. The trek route climbs towards a small white Chorten on a ridge above the camp, then turns south up the deep Mo Chhu valley. The trail stays on the west side of the largely treeless valley, climbing steadily a short distance above Mo Chhu. It then crosses the river, and climbs steeply for two hours to Yeli La pass (4,820m). From the pass, on a clear day, you can see Jhomolhari, Gangchen Ta, Tshering Gang and Masang Gang. Descend alongside a stream to a shelter, and then further downstream to a camp at Shodu (4,100m), a meadow with a Chorten. At this place, one comes back to tree line. The path follows Thimphu River, descending through rhododendron, juniper and other alpine forests. The view of the cliff facing rocks and waterfalls is stunning. Hot lunches will be served by the riverside. After lunch the trail gradually ascends to the ruins of riversides. After lunch the trail gradually ascends to the ruins of Barshong Dzong, reaching the camp at an altitude of 3,600m. The trail descends gently through a dense forest of rhododendron, birch and conifers, and then drops steeply to meet Thimphu Chhu. It stays on river left, climbing over ridges and descending to side streams. Then traverses steep cliff to Dolam Kencho, a camp among pastureland at 3,600m. The trail goes in and out steeply to the river and follows it southward to the road head at Dodena, elevation 2,600m where you will be picked up by Bhutan Travelers transport to drive to Thimphu. Visit the National Library, established in the 1960s, which holds a vast collection of ancient Buddhist manuscripts and a small collection of books. Institute of Zorig Chusum (commonly known as the Painting School) where you can see young children learning and practising the ancient arts and crafts of Bhutan. Zorig Chusum literally means the “thirteen traditional arts and crafts”. Visit the Textile Museum, which provides an excellent introduction about the techniques, style of various textiles woven in the country along with exhibitions of the national dress ‘gho’ for men and ‘Kira’ for women. Visit the Handicraft Emporium which offers a wide range of colorful, hand woven textiles and other products. If your visit falls from Friday till Sunday, then visit the weekend vegetables market held at the Centenary Farmers Market. The market provides an opportunity to mingle with the local people and sample local organic produce. Local arts and crafts are also available. Over night at Thimphu. After breakfast, transfer to Paro and departure from Paro airport.